You are currently browsing the category archive for the ‘Clinical Tools’ category. With most everyone having a smartphone these days, people are using apps to support their health. There are a few apps directed to pregnant women about their substance use and mental health. Some recent efforts developed together by researchers and health providers show how these apps can be used to offer focused information and support to pregnant women. A perinatal mental health research project in Alberta, The Hope Project, is exploring how e-technology can be used to support pregnant women with mental health concerns. Dr. Dawn Kingston and her team at the University of Calgary developed an app for screening and treating pregnant women experiencing anxiety and depression. It provides information, support, and help to women in the research study whenever they need it. The project will also look at how this intervention affects post-partum depression and the health of their children. SmartMom Canada, was developed as part of a study from the University of British Columbia. Through text messaging, Optimal Birth BC provides women in Northern BC with prenatal education endorsed by the Society of Obstetricians and Gynaecologists of Canada (SOGC). Many of these women live in rural areas and may have limited access to prenatal care. Women who enroll in the study complete a confidential survey and then receive personalized text messages that include pregnancy tips, info on health topics, and available resources in their own community. Women outside of these studies may find it challenging to find similar apps. Popular pregnancy apps do not offer much info or ideas for resources for women with mental health or substance use issues. One that has been positively evaluated is Text4baby in the U.S. The sponsors partner with national, state, and private organizations and offer local resource information in some states. Also available to Spanish speakers, an evaluation of the app can be found here. As well, apps are being targeted to health care providers on improving the care they provide. A preconception care app available to physicians provides them with information from the National Preconception Health and Health Care Initiative and makes suggestions for responding to patient questions. Research is being done on using an app to provide motivational interviewing interventions to pregnant women who use substances. Most apps available on smartphones are directed toward the general population and seek a large user base. Mental health apps and substance use apps that might support prevention, are not designed specifically for women, pregnant or not. And most pregnancy apps focus on fetal growth and “kick counters”, the woman’s weight and blood pressure, and checklists to get ready for a child. So, while there is an app for everything, they may not an app for everyone. However, healthcare technology is growing at a fast pace, so hopefully we will see more apps in future that can expand FASD prevention efforts. In 7 years, the FASD International Conference has grown to become a truly international event with presenters from six continents and from international health organizations such as the World Health Organization. Current research on clinical topics we’ve come to expect, like prevalence, diagnosis, and neurodevelopment outcomes, were featured this year along with newer topics like biomarkers and epigenetics (See some of the video recorded conference presentations here). It was the emphasis on prevention, and stigma that took center stage for many attendees. For the first time, there was a specialized prevention plenary – “FASD Prevention Research – State of the Evidence, and Plans for a Global Network” – developed by Nancy Poole (CanFASD; Centre of Excellence for Women’s Health) and Moira Plant (Alcohol & Health Research Unit, University of West England). Using a model of prevention research used worldwide that Nancy first presented in a poster in 2009, researchers, advocates and birth mothers from around the world talked about where we are and where we need to go. Watch for upcoming blogs in the next weeks for details on specific prevention presentations. The World Health Organization’s regional office for Europe has published Prevention of harm caused by alcohol exposure in pregnancy: Rapid review and case studies from Member States. In this report it is stated that Europe has the highest level of alcohol consumption in the world, and that the gender gap in drinking, and in binge drinking, among young people has narrowed. Looking over the past decade, the report features a review of 29 research studies and details current FASD prevention efforts of Finland, Germany, Lithuania, Luxembourg, Norway, Poland, Slovenia and Sweden. 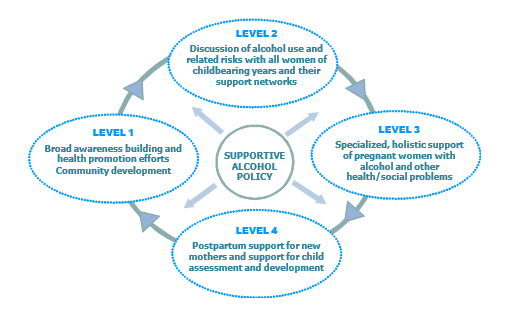 Studies included in the report were based on Recommendation 2 of the WHO Guidelines for the identification and management of substance use and substance use disorder in pregnancy, which calls for prevention of alcohol consumption in the general population of pregnant women through brief interventions. Consequently, the review excluded studies of alcohol-dependent women. For women who may become pregnant, interventions related to both risky drinking and contraception were reviewed, such as CHOICES, EARLY and BALANCE. For pregnant women, interventions to abstain from or reduce alcohol use, or to raise awareness were reviewed. Two of the studies with pregnant women included their partners and showed positive results regarding women reducing their drinking and partners supporting non-drinking. Case studies of prevention efforts from the 8 profiled countries describe national awareness campaigns; screening and specialized treatment in clinical practice guidelines; national strategy/policy planning and implementation; and post-partum support including for those affected by FASD. The report features a table that illustrates country-specific levels of FASD awareness, which can assist in developing focused strategies.